Heist movies based on real-life heists have been a thing since the dawn of cinema – hell, the very next film I have lined up after this one is King of Thieves, which is, you guessed it, a heist movie that’s based on one that actually happened – but writer-director Bart Layton’s American Animals is the first one in my collective memory that really embraces the reality of it, despite it mostly being a narrative feature. The film, which details the attempted heist by a group of young men of a series of highly valuable books at Transylvania University Library in the winter of 2003, features actors playing these roles as per the norm, including Dunkirk’s Barry Keoghan, X-Men alumni Evan Peters, rising actor Blake Jenner, and Jared “for the last time, I’m neither Logan Lerman nor Dylan O’Brien” Abrahamson; but the truly fascinating element, and this is where Layton’s previous experience as a documentarian – including the highly-acclaimed The Imposter from 2011 – comes into play, is that the real men themselves (Spencer Reinhard, Warren Lipka, Chas Allen and Eric Borsuk) are shown on-camera recounting their own experiences of the events leading up to and immediately following the incident, which are then re-enacted by the actors. It’s a concept that could have very well floundered if the blending of both fact and fiction were not so swiftly executed and seamless, but Layton is a talented enough filmmaker – and if you want to see proof, I highly recommend checking out The Imposter wherever you can find it – that it’s virtually second-nature to him to be able to combine these elements in order to tell one hell of a strange and timely story, even with one that was set well over a decade ago. There’s a lot to this movie that makes it utterly fascinating, and certainly one of the more interesting heist movies to come out in years; for one, the way that Layton incorporates the real men talking about the event over dramatized versions, through some slick editing and direction that leaves you thoroughly intrigued, is very uniquely done and sometimes very entertaining (one instance sees Evan Peters as Lipka suddenly turning to the real-life Lipka and asking if anything in the scene actually happened; another sees Barry Keoghan as Reinhard look at the real Reinhard pass by as he’s riding along in a car). The men are practically co-stars in a movie that’s based on their lives, as the movie frequently cuts back to them for clarity on a few things in the plot as well as to provide the film with a quartet of unreliable narrators (especially Lipka), while the actors portraying them are of course more of the central focus but are also tasked with re-enacting events which, according to the real guys, are eerily close to what actually happened, and they all do a damn good job of playing these characters down to a tee, which you can quickly pick up on as the movie cuts back and forth to fact and fiction fairly often. I also really admired how Layton has written this script, and especially these characters, as a very timely and even horrifying portrayal of young people and the enormous expectations of them by their elders. These four young men each come from fairly comfortable environments – none of them are abused or live in poverty, and are loved by their families as much as any safe child could be – yet there is still this burning pressure within all of them to live up to expectations that are wildly conflicting with their bigger aspirations in life. As a result, there is such a fierce underlying anger and need to rebel against the system that really drives their motivation and desire to pull off this crime; Lipka in particular, as portrayed by Evan Peters, is a wildly rambunctious young adult who wears his anger and dissatisfaction on his face like a badge, and who is truly the manic driving force of this whole operation, to a point where he becomes so determined to pull it off that he starts screaming at people that in his eyes screw the whole thing up. Yet, as angry and hungry for disruption as these young men are, they still are young and with their whole lives ahead of them, and their current desire comes across more like a temper tantrum that happens to be more thought-out than usual; they feel like they need to spice things up in their lives, but really they’re just inexperienced of the world in general and have no understanding of how reality works outside of the various fictions they see in multiple films. As such, it’s little wonder why the heist itself is as sloppy and amateurish as they come, because although they talk about it like it’s going to be such a grand and noble thing the reality of it is much more disturbing and far less civilised, since they really are just a bunch of dumb kids who don’t know how the world works but are at an age when they think they do. It’s a strong and tantalising cautionary tale of how society relied so much on these young people that it only fuelled their need to rebel even further, and the consequences were just as grim as the futures laid out for them. The film is incredibly stylish with some neat cinematography and a killer soundtrack, but is grounded by firm and focused direction by Bart Layton who brings this story to the big-screen with a healthy mixture of fact and fiction, and who also uses his incredible skills as a filmmaker to blend the two so seamlessly that the result is one of the most fascinating and unique heist movies to be made in years. It’s a film that’s definitely worth checking out for any fan of the real-life crime genre, because never before – at least in my memory – has there been one that so effortlessly uses both reality and re-enactment to such an entertaining degree. 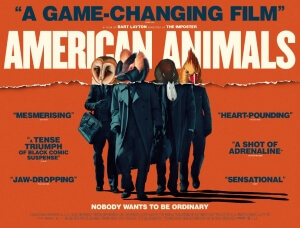 American Animals is one of the most fascinating and unique heist movies to come out in years, with director Bart Layton seamlessly combining fact and fiction to tell a very timely and intriguing story about young rebellion and valuable books.